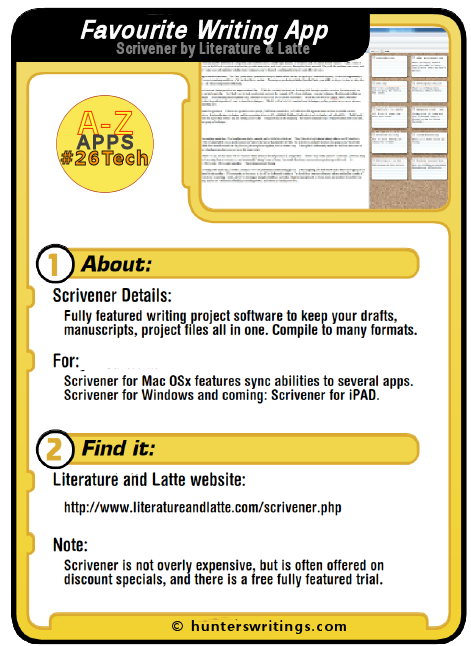 The F post for #26Tech A-Z Challenge will preview my favourite all-over writing app, which has to be Scrivener. Created by Literature and Latte several years ago, Scrivener has to be one of the most popular apps for writing work, and understandably so. You can trial Scrivener for a full 30 days of usage, unlimited in functionality. Compared to many packages of writing software, Scrivener’s $40 price is inexpensive, but L&L are good at offering discounts too. Available for Mac OS (Version 2) and Windows PC (Version 1+). We still await the much-anticipated iPAD version. Binder – arrange structure of text files, keep media files – PDFs, images, and website pages in an in-app browser; organise via folders and sections and call them what you need – scenes, chapters, acts, parts. The Editor – A rich-text editor, with dictionary and spell-check plus other writer’s tools and autosave. Also, Markdown support [See my own Scrivener, Evernote and Markdown workflows]. 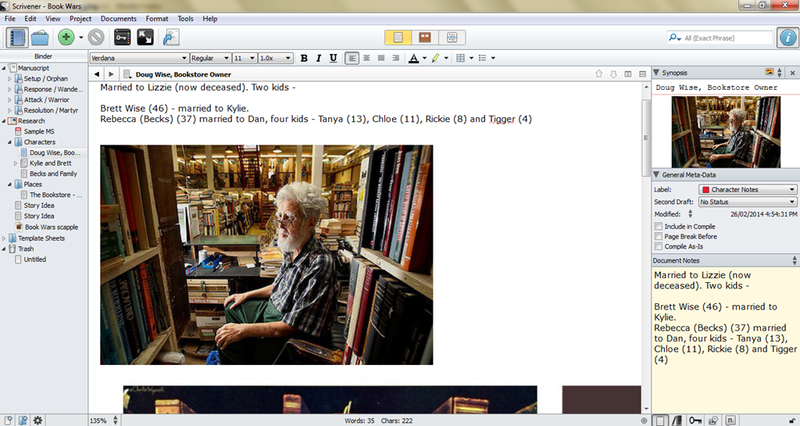 The corkboard notes can contain an image, or text useful as synopsises or summaries of the note (which could be a scene, chapter or larger section). It’s perfect for high-end plotting and structuring your work. Compile in many formats for publication or sharing – HTML, PDF, Word, rich text files, or epub and mobi formats for e-publishing. Text analytics – set wordcount goals per project or writing section, track progress. Custom use – Both Windows and Mac users can create templates from their projects, share them, and reuse the same format for successive projects. In-built templates provided. Powerful search and filter functions – find and view exactly what you want. Take snapshots of scrivening files, and reverse back to them if revisions go wrong. Scrivener also provides various views of work – multiple files in panels, combined views, corkboard summary views, filtered searches and collected views. Literature and Latte’s own brainstorming free-form app called Scapple is integrated into Scrivener. [Blogged here]. A fantastic tool. Story Skeleton is an iOS app which lets you set up the high-level structure of a new writing project – and import/export in Scrivener file format. [Blogged here]. Index Card App (for iPAD) can be sync’ed with Scrivener for Mac, using the free-form corkboard functions. (More on Index Card coming up in the I post for #26Tech). Gwen Hernandez, author of Scrivener for Dummies, offers a 6 week virtual Scrivener class for writers. Gwen’s website offers articles on Scrivener. Get the book, take the courses. Everything Scrivener curates lots of good advice, tips and general fandom on Scrivener from across the web. Joseph Michael is the “Scrivener Coach” and endorsed by Literature and Latte for his set of video courses and tutorials. I was so impressed, I became an affiliate. Click on this link to take a look and select a package of Scrivener courses to suit. Joseph Michael provided further explanations on Scrivener in a recent article at The Creative Penn – 8 Ways Scrivener Will Help you Become a Proficient Writer Overnight. So, you’re saving up for Scrivener, or it’s not quite for you? Nine alternatives to Scrivener will be listed in the supplementary post of today. 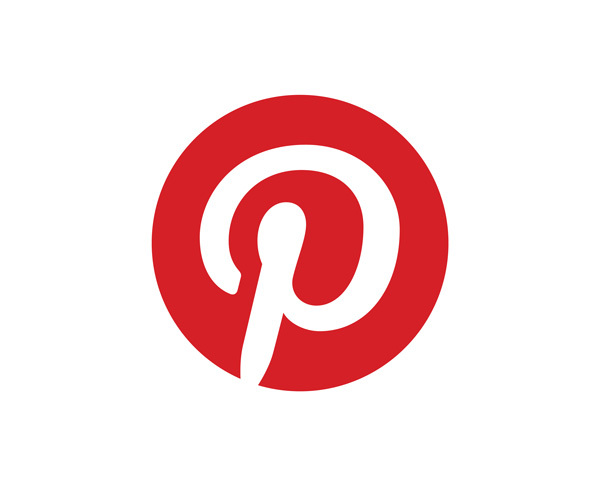 #26Tech: This was the F post for my A to Z challenge, where this blog will be posting 26 days worth of Tech posts relevant to writers and creatives.